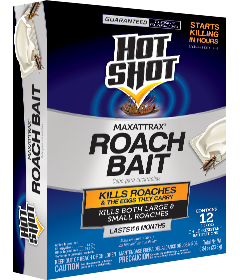 Place bait stations where roaches have been seen or in out-of-the-way places near walls, in cabinets, under sinks and refrigerators and in closets. Replace baits every six months for continued control or sooner if infestation is heavy. CAUTION. Wash thoroughly with soap and water after handling bait stations. Keep out of reach of children. Do not place bait on surfaces where food is being prepared or on utensils that are used for food preparation. Do not store near or contaminate food. Do not remove bait from container. NOTE TO PHYSICIAN: Atropine is antidotal and should be administered only if symptoms may appear. Chlorpyrifos is a cholinesterase inhibitor.